The holiday season has got off to a flying start this year with last weekend's Valaddo and this weekend's Notte Bianca (white night). "What is the Valaddo?" I hear you ask and also "What is a white night?" Lets answer these two questions in order. The Valaddo is an annual get together by groups of people who share the heritage of Occitan culture. This is a cultural and linguistic group that covered the suthern part of France, Spain and the western Italian Alpine valleys. The traces of this culture can be clearly seen in the names of the French "department" of Langue d'Oc meaning those who speak Oc the language of Occitania. It is an event that generally involves lots of dancing, singing and generally having fun. Serious enthusiasts will dress in traditional costume and show off their traditional dancing skills as well as talking in the almost lost language of Oc. A white night or Notte Bianca as it is properly called is simply a great excuse for a good night out. It is a night that the shops stay open extra late and the streets are filled with music, entertainment and side shows. They have been very successful in the big cities with even the museums stayig open until the early hours. 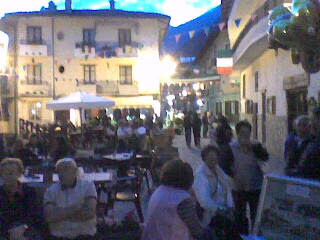 Here in Fenestrelle we have just held our own Notte Bianca. It may have been on a smaller scale but it still does not stop us having a good time! The night was warm and balmy, the street was full of people and one of the great things about our little town is that all age groups were present and enjoying themselves. We had music, entertainers, good food and wine as well as being able to wander in and out of the shops that not only stayed open later but had made a special effort to welcome visitors. apologies for the photo quality. These were taken by mobile phone camera. Certianly Fenestrelle is not a Grand City with sophisticated entertainment but it is certainly a quiet little town that knows how to entertain and provide a relaxing location for a holiday!